It is the third week of The Plunge and we’re going strong! If this is your first time adventuring with us, you are welcome here! Just visit the Take the Plunge page on my website and sign up to get the weekly e-mails. Just a reminder – although we can’t choose what happens to us, we choose how we respond to it. The Plunge is just another way to CARPE DIEM – and seize each day, making every day THE BEST DAY EVER! Choose to live the best life. Live the adventure and grab hold of the journey. With that being said, let’s jump into Volume 3! The words we speak to ourselves, both internal and external, are the words we begin to believe. I find myself – all the time – but especially during the holidays, telling everyone just how crazy busy everything is. Allowing so many of my words to express busyness and frantic chaos just makes everything worse. It also makes everyone around me feel like I am out of reach or untouchable because I am always talking about how busy I am. Then I miss all the special moments because I’m too busy thinking about what I have to do next. A couple months ago, I felt convicted to remove those words from my vocabulary and start living in the moment I am currently in WITHOUT thinking about the rest of the crazy moments that were right around the corner. It has made me feel less stressed and more fulfilled at this time of year. A great blog by Ann Voskamp talks about how too busy is a choice and that life is a gift. So let’s focus on the gift and not the busy. PLUNGE #1: Take all language out of your vocabulary that suggests you are too busy, too crazy, or stressed and overwhelmed. As hard as it is, don’t complain to others about your schedule this holiday season. Sickness starts to creep in this time of year, and much of what we suffer comes because of all the stuff we put in our body that doesn’t help us fight the germs. Much of the drinks we consume do nothing to boost our immune system or make us feel better. Just two years ago I was drinking TWO 2-liters of Diet Coke every single day before noon. And I was always feeling run down and nasty. Since I’ve dropped all pop and sugary drinks, I feel so much better. I get sick less, I’m less tired, and I just all around feel more energized and ready to face each day. There are many opinions about how much water one should drink a day, so I will leave that up to you. One suggestion has been 8 – 8 ounce glasses daily. But to boost your immunity before the holidays and support your body, it is time to drink more water. WebMD has a great article about the benefits of water. Check it out here and start your weekly Plunge out right: take that Camelbak or water bottle to work today – keep filling it up – and know you’ll have to hit the bathroom a few more times than usual. PLUNGE #2: Drink the doctor’s full recommended dose of water a day. PLUNGE PLUS: Drink ONLY water this week – no soda or coffee. ‘Tis the season of red kettles and bell ringers. Everywhere we go, grocery stores and Wal-Marts, there are volunteers spending hours in the cold ringing bells to raise money for the Salvation Army (Want to know the story about how all that started? Check out Wikipedia’s article about it). Who is doing something good for these do-gooders giving their personal time for a good cause? 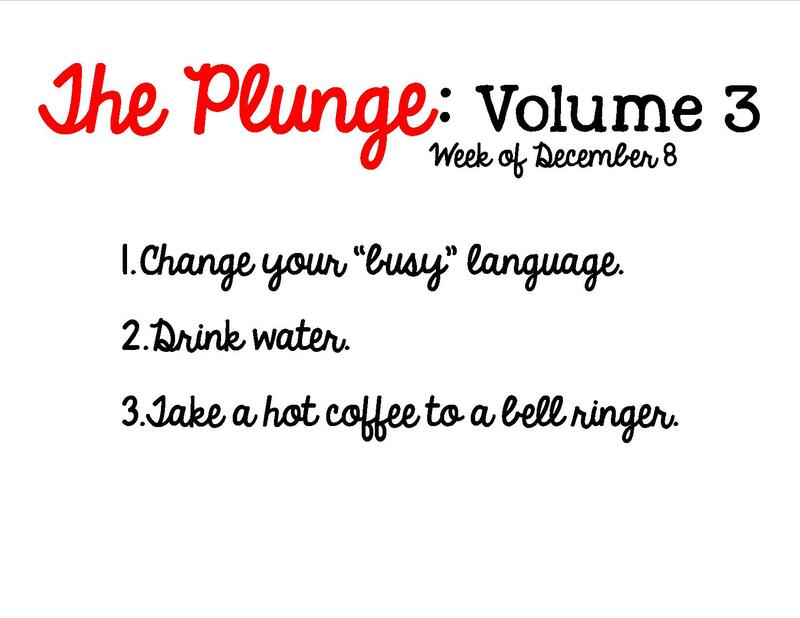 PLUNGE #3: Buy a coffee or hot chocolate and give it to a bell ringer at your local grocery store or Wal-Mart. PLUNGE PLUS: Write a thank-you letter to accompany the hot drink. It is never easy to approach a total stranger (last week we only had to leave a letter for a stranger and never talk to them). We’re naturally afraid of rejection, so we hesitate to do anything that might place us in that situation. This week, throw yourself into the Plunge with complete abandon. Change your vocabulary, your water intake, and a bell ringer’s day. Choose change. Romans 12:2 tells us not to conform to this world. This world tells us that the busier we are, the more worth we have. As Christians, we should not be of this world, but living life to the fullest. The Lord has promised in Matthew 11, that if we come to Him, He will give us rest. Let’s turn this holiday upside down and change our vocabulary to one of rest and fullness in Him. As you drink more water this week, remember that although we are living in this world, the eternal world is what really matters. Finally, when it comes to giving to others? There are more scriptures than I could post in this blog. But here are just a few you can read to inspire you as you make the day of a volunteer bell ringer. Thanks for joining me in The Plunge. Our group is growing – but we always want to invite others on our Journey. Please share, comment, share, comment and invite others. Thanks to those of you who post your weekly results on your Facebook page. I enjoy reading how The Plunge is changing your journey. Remember: today is the BEST DAY EVER! P.S. If you would like to e-mail me your Plunge Report, I would love to include it in one of my blogs. You don’t have to do ALL THREE Plunges…just tell me your experiences! Your weekly printable to hang on your mirror as a reminder of The Plunge! Posted in The Plunge and tagged bell ringer, change, choose joy, red kettle, salvation army, water. Bookmark the permalink.